Ophthalmology residents in the University of Louisville’s Department of Ophthalmology & Visual Sciences find an environment ideal for their professional growth and development. Whether they are seeking to establish careers in research, academic medicine or private practice, residents have all the resources and guidance they need to excel upon graduation. Under the supervision of a dedicated team of faculty members, many of whom are world-renowned in their specialties, residents fully explore the field and many of its sub-specialties, paving the way for successful careers. UofL’s Ophthalmology Residency Program accepts four residents per year, making it the ideal size for those in search of a wealth of clinical experience and resources, complemented by close interaction and collaboration with faculty. 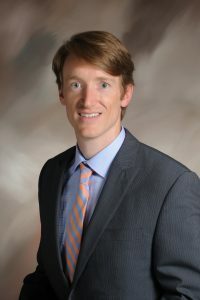 During the second year of residency, there is a three-month block for the Consult Service in which residents manage inpatients at University of Louisville Hospital, Norton Children’s Hospital, Frazier Rehabilitation Institute, Jewish Hospital and Norton Hospital. Over the course of the program, residents work closely with faculty one-on-one, receiving the input and feedback needed to ensure they have all the knowledge and skills to work independently as the residency program progresses and is completed. Didactic Conferences are held every Friday morning, from 7:30 am to noon, in addition to regular sub-specialty conferences, journal clubs, surgical conferences, and sessions in the Wet Lab and Fresh Tissue Lab. Members of the Ophthalmology faculty at the University of Louisville are known around the country and the world for their groundbreaking research and development of new treatments and procedures, as well as their clinical experience. Though many of them are considered among the very best in their fields, they are always approachable and open to close collaboration with our residents. Faculty members make sure to provide ample direction, followed by informative feedback and input, while also allowing residents to function independently. The primary care eye clinic, pediatric eye clinic and adult eye clinic are housed in the state-of-the art Kentucky Lions Eye Center, where residents see patients of all kinds with a wide range of diagnoses. They learn to work with attending physicians at each facility, broadening their skills and experience. Over the three years, residents rotate through the Louisville Veterans Affairs Medical Center. There, they treat a very large and diverse patient population, and are provided valuable surgical experience. The VA Medical Center is home to a state-of-the art clinic, and a well-equipped, fully-functioning OR. Our four-week International Rotation, an elective in the third year, provides our residents the opportunity to gain experience abroad. Residents in the past have traveled all over the world to places such as Nepal, India, Israel and Pakistan, where they can observe and partner with local doctors, treat eye diseases and conditions not commonly seen in the U.S., establish and improve eye clinics, and offer support and treatment to people in need. The Accreditation Council for Graduate Medical Education (ACGME) requires that residents participate in scholarly activities, such as presenting at journal clubs and Grand Rounds, as well as publishing and participating in research. We support that requirement with a strong commitment to all of these activities. Our faculty is doing groundbreaking research in most areas of ocular disease, from stem cell therapy for retinal degeneration to new treatments for Dry Eye Syndrome, providing a wide range of opportunities for resident-mentor collaboration. No matter what their interest, residents are likely to find a faculty member who will mentor them in that area. Residents also have the opportunity to present their research and results at regional and national meetings, including the annual Residents Day in June. In addition, Friday mornings are set aside for didactic seminars and conferences. Residents have access to the University of Louisville Ophthalmology Department’s full Wet Lab and Fresh Tissue Lab facilities. Residents can hone their skills on state-of-the art equipment, practicing various eye and eyelid surgeries, as well as orbital surgeries and orbital dissection through the department’s orbital dissection course. Residents are encouraged to use the labs as often as they like. 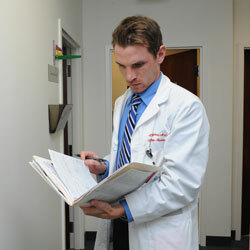 Residents in UofL’s Ophthalmology Program have gone on to do great things. Many have been accepted into strong fellowship programs at prestigious institutions including Harvard University, Johns Hopkins University and Washington University, among many others. Every resident who completes the three-year program leaves exceptionally prepared for the professional challenges they’ll face, whether they pursue further training, or a career in academic medicine, research or private practice. Prior to starting the residency, physician candidates must attain one year of training (PGY-1) in which they have primary responsibility for patient care in fields such as internal medicine, neurology, pediatrics, surgery, family practice, or emergency medicine. A minimum of six months of this year must be a broad experience in direct patient care. A medical license to practice in the state of Kentucky is also required.